The Mayan Indians hold copal as very sacred and have used it in ceremonies since ancient times. The name for copal is pom in Mayan tongue. Copal resin is said to reveal invisible energies that appear like rays of sunlight filtering through an early morning mist. Healers often used it as a diagnostic tool to help them see the deeper dimensions of a client's energy field by gazing through the smoke to detect energy blockages and dis-ease. The resin is also used for clearing and clarifying the mind since it holds the influence of purification and protection. 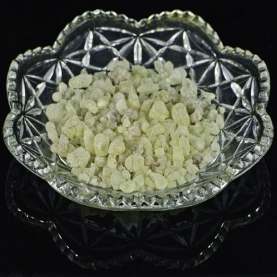 The dried natural resin, when burned, emits an odor similar to frankincense but with a lighter, citrusy tone. The resin is formed when the tree is cut and a thick milky liquid seeps out. It is dark in colour, very black, but changes color as it dries. How to Burn Resins: Light the charcoal with matches or lighter for about 20 seconds until it self-ignites. Use tongs to hold it up (never hold it with your fingers alone or you might get burned). Place the lit charcoal in a bowl or any incense burner. The bowl or incense burner should be filled with sand or dirt. Let the charcoal warm for a few minutes. (It turns gray around the edges when it is ready) Now you are ready! Add a small amount of resin on top of the charcoal. The resin will burn and soon release essential, aromatic oils through the smoke. Continue to place resins or powder on charcoal as they burn out and smoke decreases for a continuous burn.